After Lina's excellent report on her blog, I thought I might as well add my 2 ringgit to the story. 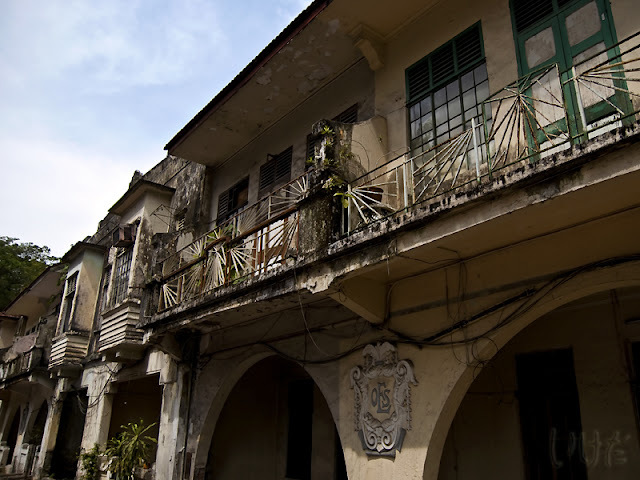 The day we were meeting for lunch at Little Penang Cafe, I was actually running around like a headless chicken. In the morning I was at Menara KL Tower admiring the views, and then I got a brilliant idea of walking down to Merdeka Square and taking some sort of train from there to Mid-Valley. Yeah, stupid. I know. NOW I know. But I didn't know it back then. And so upon realizing just how stupid my plan was, I figured the best way to remedy the situation would be to just take a taxi to the mall. Now, getting a taxi in KL seems to be either very deceptively easy or fiendishly hard. Take your pick. In front of some bank I found a taxi stand with a line of taxis awaiting customers. I approached the first car and got in. The driver asked me where I wanted to go. I told him to Mid Valley Mall. He said "meter broken. 56 ringgit." I laughed in his face and got out. I approached the second taxi. This driver saw that something had just happened with Contestant Number 1 and was very cautious. He rolled down the window and asked me where I wanted to go. "Mid-Valley Mall," I told him. He looked at me very carefully and started with his "meter is broken" story and upon seeing my face, he realized he made a mistake. He pleaded with "only 30 ringgit!" I laughed in his face and walked over to Contestant Number 3. He saw that something was up, Contestants Number 1 and 2 were furious and getting out of their cars, so as soon as I got in his taxi, he immediately said "Meter is working fine miss, where do you want to go?" 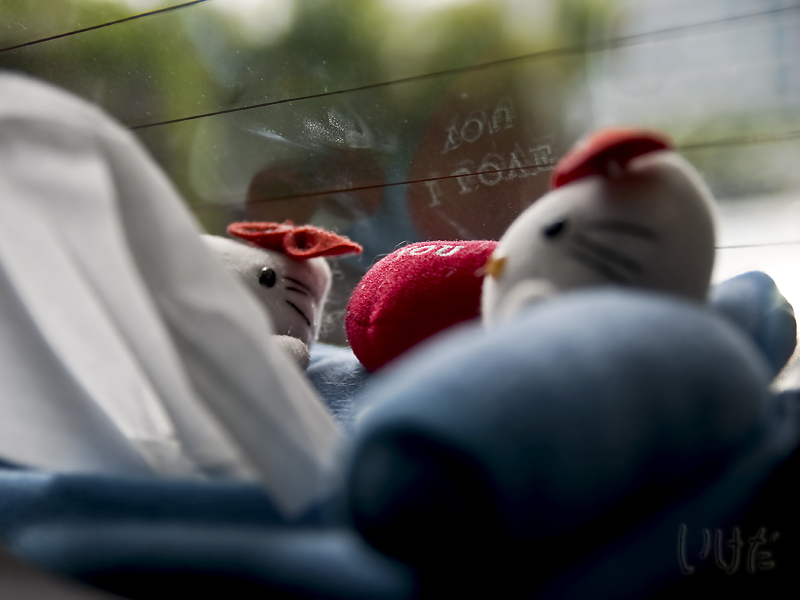 And he even had a Hello Kitty tissue box holder in the back. And so he got me to Mid Valley in record time and for 15 ringgit. Yeah, probably still too much, but I told him he needed to be there by 1PM and damn, he did it. He backed out (in reverse and partly on a sidewalk) from a massive lunch-time jam (which if we had stayed there, would have gotten us to Mid Valley sometime around Easter) and took a very creative route instead. And he got me there on time. Very impressive all around. Taken from the taxi before the driver yelled at me to roll up the windows. He said something about snatchers on scooters who can grab my camera and zoom off. 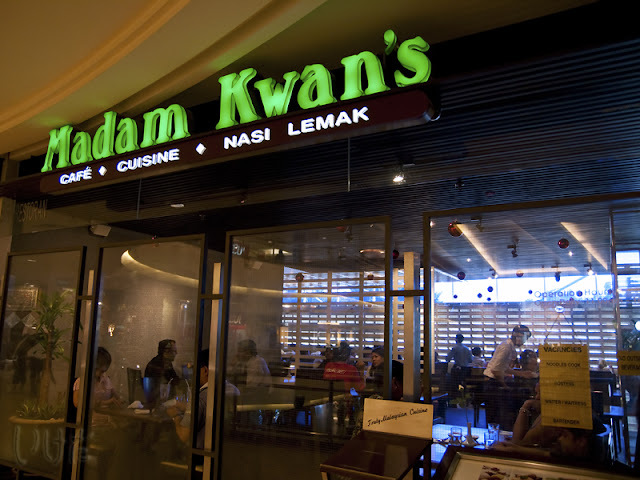 When I arrived, it turned out that the waiting time at Little Penang Cafe was approximately 5 years (give or take a month) and that's how we ended up at Madam Kwan's upstairs. Everything was oh-so-good. I'm drooling even now when I think about that lunch. And feel free to drool too. Just be sure to protect your keyboard. 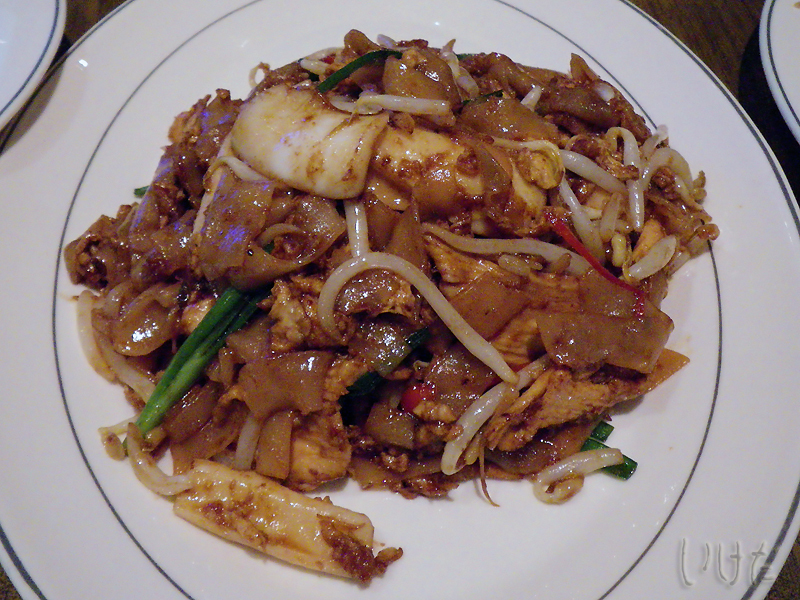 Char koay teow - NOM NOM NOM!!! Stinky bean something, a.k.a. 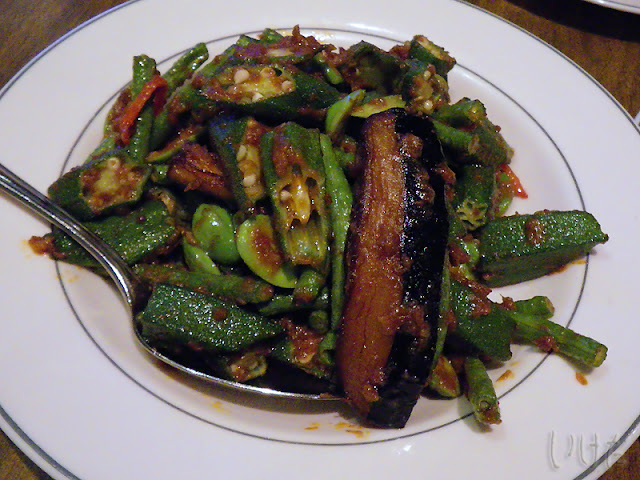 stir fried veggies with belacan - NOM NOM NOM!!! 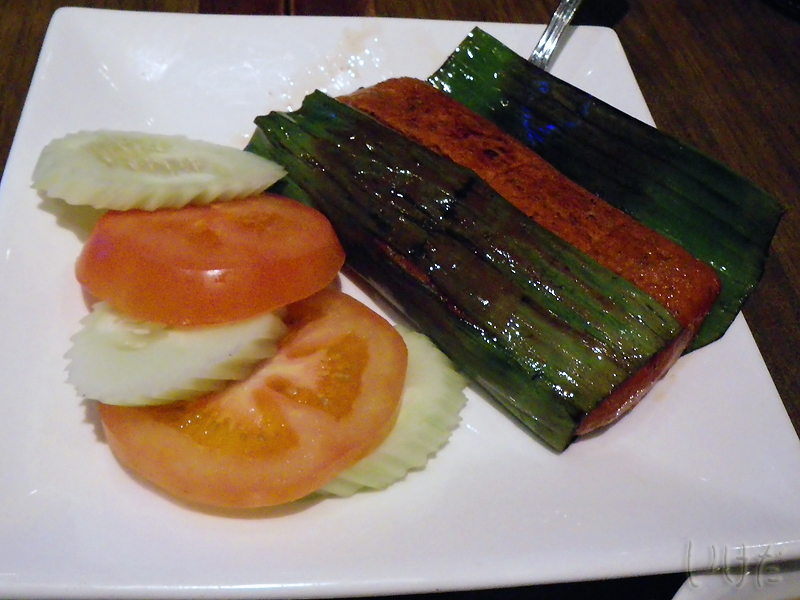 Otak-otak, or fish in banana leaves - NOM NOM NOM!!! 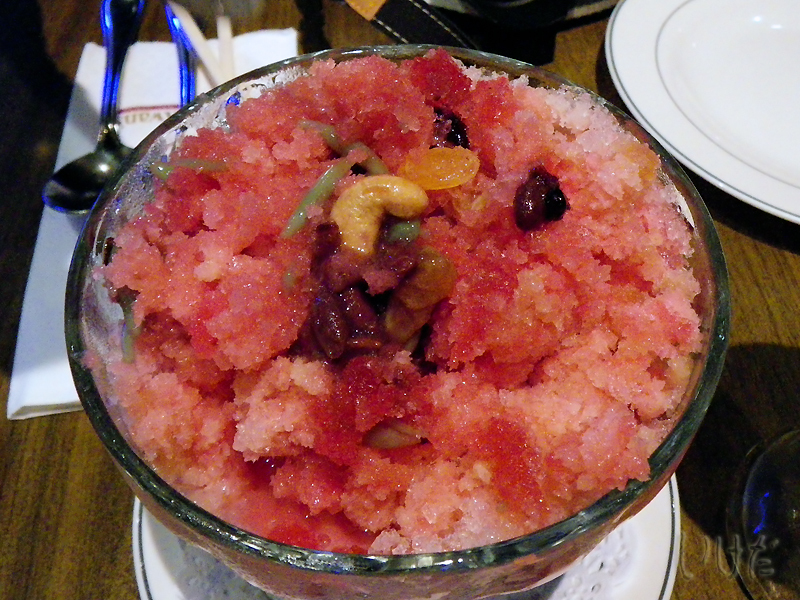 Shaved ice with some red flavor thrown in, along with a magnificent collection of stuff: raisins, nuts, corn, sweet beans and generally - the sort of stuff you have absolutely no clue what to do with on a normal day. But it was yummy - NOM NOM NOM!!! Now, if you excuse me, I am hungry. I shall go sit in the corner and weep while looking at these photos.